Ukraine: Estonia PM speaks to BBC Jump to media player Estonia's prime minister has warned of an escalation in violence before Ukraine's ceasefire deal comes into place on Saturday. EU warns Russia on Ukraine deal Jump to media player EU leaders warn Russia that it could face further sanctions if it fails to fully implement a deal to end the war in Ukraine. BBC films as troops told of peace deal Jump to media player The United States has welcomed a ceasefire agreement aimed at ending the war in Ukraine but demanded that Russia end its support for the separatists. Ukraine deal to be put to the test Jump to media player Leaders who have been meeting in Minsk to try to secure a peace deal, have announced an agreement on a ceasefire in eastern Ukraine. What happened in Maidan Square? Jump to media player A brief look back at the events in Ukraine, focusing on 20 February 2014, one the bloodiest ay of Ukraine's civil unrest. President Obama visits Stonehenge Jump to media player Before US President Barack Obama returned to Washington after this week's Nato summit in Wales, he decided to make a detour to visit to Stonehenge. Estonia's prime minister has warned of an escalation in violence before Ukraine's ceasefire deal comes into place on Saturday. 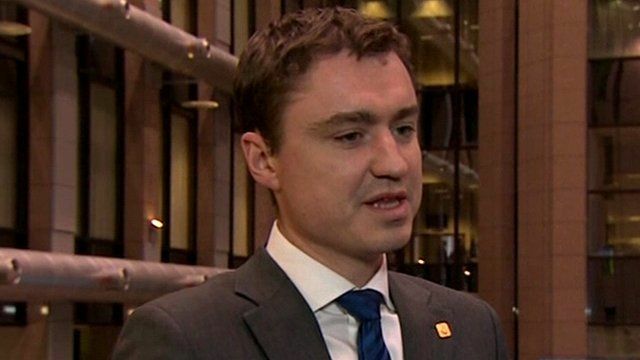 Speaking to the BBC, Taavi Roivas said: "The worrying thing is that we still have two days to go until the ceasefire, and... I'm afraid there will be an escalation from the Russian side during that two days". Intense fighting has been reported in eastern Ukraine, a day after the peace deal was reached in Minsk. The ceasefire is due to begin in eastern Ukraine after midnight (22:00 GMT).